A Spark of Hope is meant to do just that, give hope where there was none. Their aim is to encourage us to appreciate and value life, it is a precious gift. To change the things we can and accept the ones we cannot change, always with that Spark of Hope in our sights. 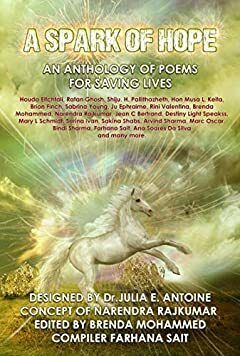 A Spark of Hope is a collection of 49 hopeful poems, mostly by contemporary or new poets, both acclaimed and lesser known. These poems call us to the plight of the down-trodden, the victims without hope. It forces us to reach deep down within ourselves and retrieve a spark of hope to share and bring a bit of comfort to those who need it mostâ€¦ A Spark of Hope is all it takes sometimes!